“Oh Anatol” is what I guarantee you’ll be sighing throughout The Affairs of Anatol as you follow our hapless hero (played by Wallace Reid) through a series of ill-fated advances on a variety of female archetypes. Set in the wildly opulent 1920s, Cecil B. DeMille’s picture does not hesitate to bombard us with tantalizing visuals and moral taffy. It was about this time (perhaps 2 minutes into the film) that I found it necessary to start pausing the DVD in an effort to fully admire Vivian’s Art Nouveau boudoir, with its swooping backlit trees and grace. Rereading the dialogue frames was also necessary for me as I found nearly every one terribly clever, and many times I even wrote them down for future reference. 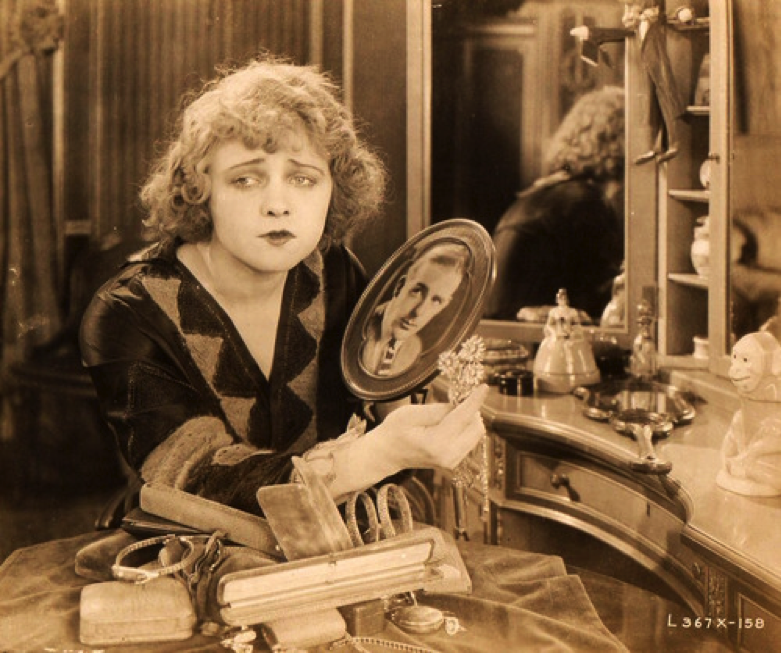 Our very first sigh is elicited by the precious face of Emilie Dixon (Wanda Hawley) as Anatol recollects her as a youngster biting into an apple (see what DeMillle did there) matched with her present action of slyly applying a good helping of lip rouge. She must be saved from the filthy grandfather type who is smoking a cigar and filling her glass with booze he produces from a pocket flask. It is up to Anatol to put her back on the path of moral integrity! With this highly self-righteous goal, our hero embarks on his tour of unfortunate encounters with the devious woman. Good heavens, has this little morsel of angelicalness accumulated a treasure trove of jewels, and in the inferred way that such a young girl does so – to boot! When our “savior” finally comes to realize that he’s been had, one of the most epically destructive of screen temper tantrums ensues. Quite honestly, I’ve never seen anything like this whirlwind, and were I referencing moral outrage, I might compare it to Jesus and his temple tantrum. In these moments with Emilie, you will want to be sure to have your remote in hand. There are some marvelous party gowns you will need to pause on to soak in their beauty. The scenes at The Green Fan will also require a bit of pausing. The naughtiness of the menu wording is worth investigating and snickering over, too. After such a blunder, isn’t it best to return to nature? Oh, but Anatol, girls are all the same! They’re just waiting for you to show some kindhearted weakness they can take advantage of – AGAIN! Yes, even the simple country girl, played by Agnes Ayres, just wants your money. When our hero finally realizes that he’s actually been after a wild-lady adventure and decides to no longer deceive himself, that’s when this story and its visuals become entirely freaking amazing. Enter Satan Synne (why hasn’t some neo-burlesquer snagged this name? ), the ultimate vamp with the language and calculated demeanor of a true femme fatale. Through all of her attempts at frightening off our hero, he persists. You will definitely need to pause the show to take in all of the scenery in Satan’s lair, and her delectable costumes and props. 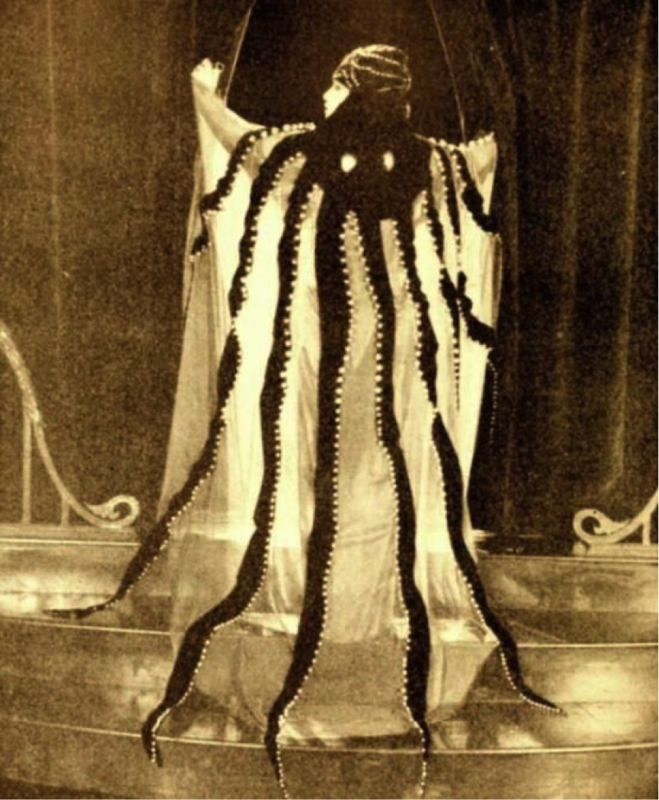 As a spoiler, just so you have your drool bib handy, she is wearing a cape styled like an octopus with a hat to match and the movement of this piece is just gorgeous. I’ll leave the end to your imagination. Are all women evil? Are all women in need of a man to save them financially and morally? Will our hero’s wife take him back? Does Satan ruin him? Oh Anatol, you big sap. 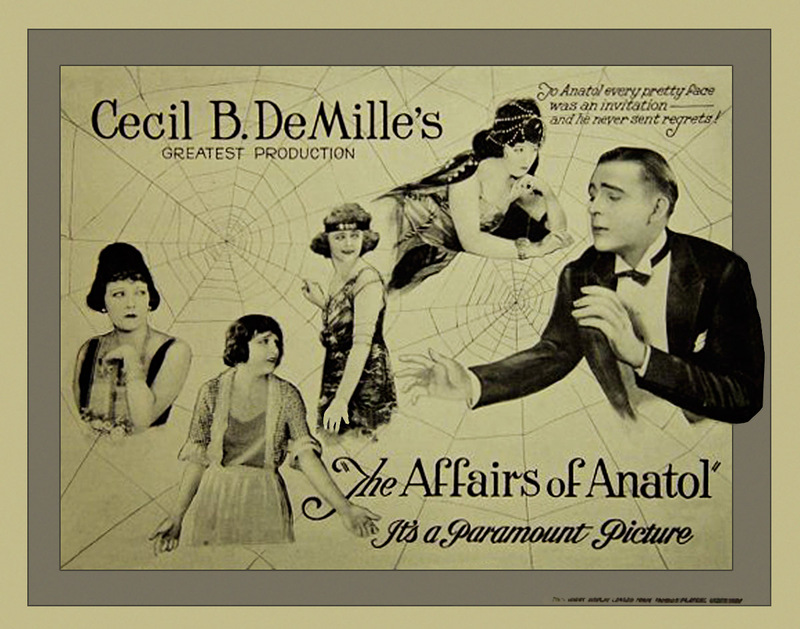 The Affairs of Anatol (1921, silent feature) is now available on DVD from Flicker Alley. Cecil B. DeMille’s risque all-star revue of decadence has been digitally mastered by historian and archivist David Shepard from an elaborate original print featuring hand coloring, stencil coloring, and dozens of changes in color tint and tone, in itself a striking work of art. 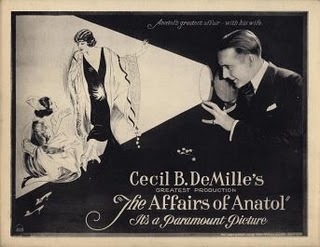 The Affairs of Anatol is presented at a visually correct projection speed (21 frames per second) with a digital stereo score compiled by Brian Benison from authentic silent cinema music. Our friends at FlickerAlley have given EatDrinkFilms readers a 10% discount if you use the discount code D64YUMTW. Order from Flicker Alley. Evie Lovelle was an awkward child who was sent to finishing school. She is a sometimes film actress, sometimes seamstress and sometimes writer who is always a film enthusiast. 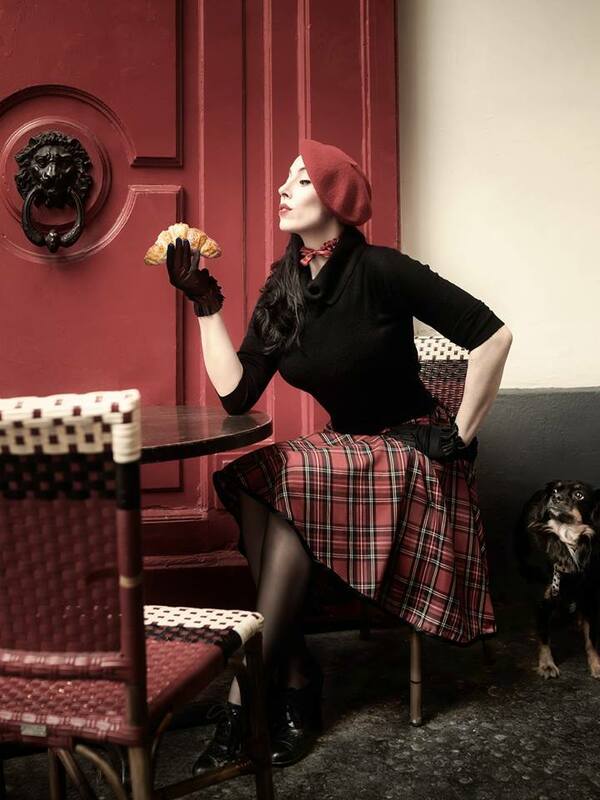 She has also been known to practice strict Classic Burlesque for the likes of The Film Noir Foundation and Paris fashion houses. The New York Times and The Wall Street Journal have compared her to Rita Hayworth. She is currently working on her first book, “The Pretty Girl’s Guide to Going Unnoticed” and resides in Los Angeles with some guy and two ridiculous cats. This entry was posted in Films, Films: Silent and tagged Affairs of Anatole, Evie Lovelle, Films, silent film, silent movies. Bookmark the permalink.